Located at 3050 meters above sea level north of river satluj, Tabo is one of the most beautiful villages in Spiti valley and home to the most ancient monastery. According to the inscriptions reflects Tabo monastery was founded by the Ancestors of Bodhisattva; the Purang-Guge’s king Ye-shes od. Motivated by the thought of enlightment, Byang-chub-od restored this monastery according to the biographical information by Ye-shes-od and Rinchen Zangpo, the monastery was probably built in AD 996. Day 1. Arrival/ evening panoramic view from ancient caves. Day 2. Millennium Monastery visit in the morning/ rock crving at sha/ lunch/ Local home visit. One day hiking/ trekking to Angla and Phela (nomadic plains on the hills north of Tabo). A small climb. Nadang Lhakhang and photo shoot. Cultural show(Bhuchen dance / cham dance), with local food and tea. Dechen lama is our recognized guide. Kaza hill station is a very calm and quiet place in Himachal Pradesh. The hill station of Kaza is bifurcated into two- old town and new town. The new town of Kaza houses some of the government buildings. The famous Ki Monastery is located at a distance of 11 kilometers from Kaza hill station. 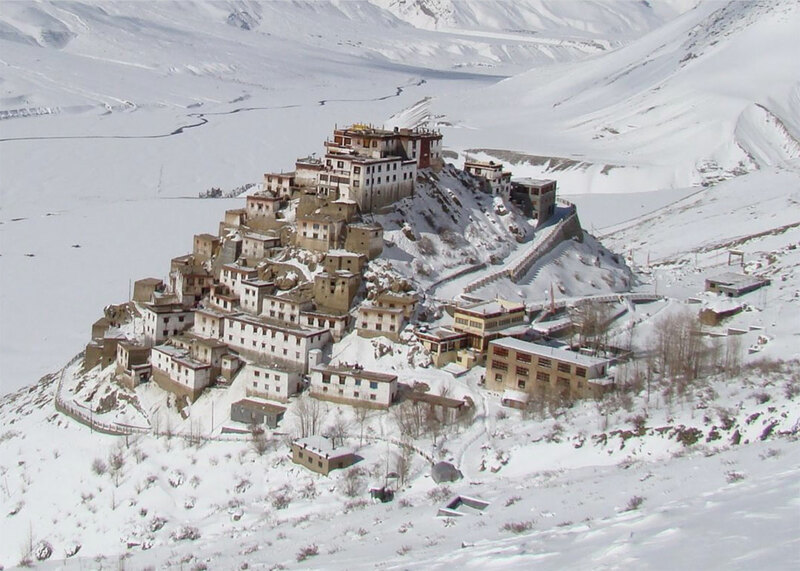 This monastery is the most renowned and the biggest monastery of the valley of Spiti. The amazing hill station of Kaza can be reached from Shimla by covering 425 kilometers. The Kaza town is the sub-divisional headquarter of the Spiti valley. Rangrik is the largest village in Spiti 10 kms. from the administrative capital Kaza. A calm village full of stretched greenery in the season. The Grand Dewachen is located just besides the village viewing the Kee-monastery standing like a castle. Day1 : Arrive from Tabo/ Manali / rest for acclimatisation. Day 2 : To Kee monastery- kibber- lunch at Grand Dewachen Retreat to Kaza market for street shopping in the evening. Day 3 : walk to famous rangrik rewa cave. Day 4 : early morning Herbal walk. Visit to Langcha- Hikkim- Komic monastery (highest village in Asia) ans fossil hunt. Day 6 : To pin valley; Visit Kungri Monastery and the last village Mud + photo shoot. * Cultural show/ Bhuchen dance. Spiti is the sub division of Lahaul & Spiti district with its hqrs. at Kaza. It is called "Little Tibet" because it has almost the same terrain, vegetation & climate . Spiti also means "Middle Country". It lies between Tibet, Ladakh, Kinnaur, Lahaul & Kulu. From Shimla via Kinnaur there is a motorable road which remains open upto Kaza for 8 to 9 months. About 10kms. ahead of Pooh, satluj enters India near Shipki la & Spiti river joins it at Khab. The road then goes to Sumdo via Hangrang valley. From Sumdo Spiti valley starts. The valley is not wide but there are villages and some fields where people grow barley, buck- wheat, peas & vegetables. It has an area of 4800 sq. kms. Some inhabitants have adopted Budhism as there faith and Bhoti is the spoken language. The people are simple and honest. The main Spiti valley is split into eastern and western valleys. They are connected with Ladakh & Tibet on eastern side & Kinnaur and Kulu on western side through high passes. The Spiti river flows fast through deep gorges at some places.